Earlier this month, I decided to intensify studying French and scale back on Japanese and Hungarian. I used to spend an equal amount of time and effort in all 3 languages. But the divide-and-conquer strategy wasn’t working too well for me, especially with my busy work schedule. I felt that I am making great progress in French, despite only studying it on my own. I do not have a fixed schedule in studying. I just try to take advantage of whatever little free time I have: during my morning and evening commutes, before bedtime, after waking up, waiting in line at the bank. 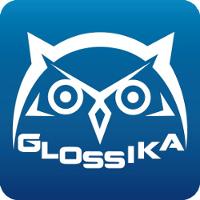 What I do have is a wealth of great materials: books, audio courses, podcasts. 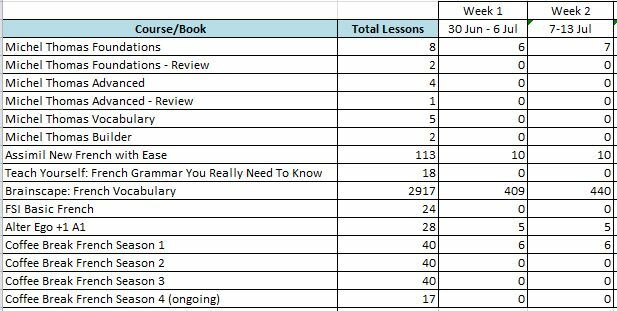 My goal by year end is to finish all of the lessons in Assimil New French with Ease, Teach Yourself and Michel Thomas. Listed below are what I currently use and the progress in each of them. 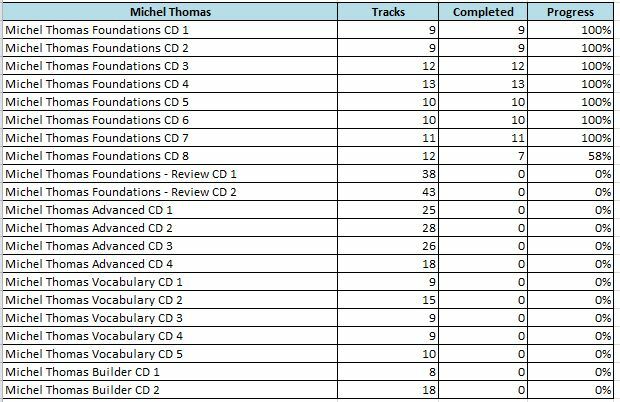 For example, I was able to finish 7 out of 8 lessons for the Michel Thomas Foundations level at the end of week 2. I am not sure if I will continue with Coffee Break, FSI and Alter Ego. I will just see how things progress and maybe I can study some or drop some as I see fit. I must say that I am a huge Michel Thomas fan now! This method just works like magic. I like that each sentence builds on the previous one until it becomes longer and longer and the student can confidently say: Will you have dinner with me tonight at the house because I need to speak to you. It is very important for me. If I had stuck with only my classroom lessons, it would take me months to learn to say something like that. I really wish there is a Michel Thomas program for Hungarian. I love it and it really works for me. I am having a hard time with Hungarian because of the pronunciations and because the words are very different from the ones that I do know. In other news, my boss told me today of some great progress he made with his Tagalog. His wife and kids are in Manila for a month-long vacation and over the weekend, they were in Tagaytay. On the way there, the driver was telling the wife something in Tagalog and she proceeded to translate in English for him. But he told her what he understood from the conversation. He said he didn’t understand everything, but he managed to pick up words and from the context, he was able to get the meaning. She was impressed at his improvement…and I was over the moon!! Proud teacher, right here!